The DRD2X Apex Series LED Downlight Module and the DRD4 Adjustable LED Downlight Module integrate with DMF’s OneFrame System. The Apex Series LED DRD2X delivers architectural-grade illumination up to 750 lumens and 4000 candelas and is a 90+ CRI-rated LED. Precise, controlled optics put light exactly where you want it with 20-, 30- and 40-degree beam angles for the right focused beam pattern. The DRD4M is an adjustable LED module with an integrated driver that allows it to fit into practically any space, making it ideal for any spot, accent or directional lighting application. Should you need to change the angle of the light or swap out optics, it can be done by hand eliminating the need for a tool. 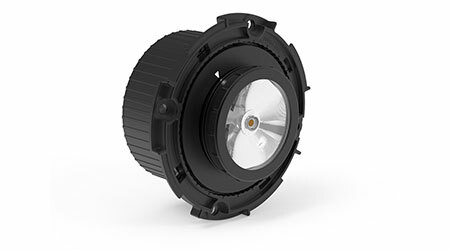 OneFrame supports general downlight, spotlight or directional light modules and meet stringent wet location, fire and efficiency requirements. Their Twist & Lock features makes installation almost as easy as screwing in a light bulb. Each element is designed to work together, making the process easy to install and requires little use of tools. Plus, OneFrame’s floating module height ensures perfect alignment with the ceiling. Energy Star and Title 24 rated, and JA8 compliant.